Acceptable items to send for autograph requests include: hats, diecast, t-shirts, flags, or other merchandise. If you do not have merchandise to send for an autograph, you may request a hero card when you send your request. ALL REQUESTS MUST INCLUDE: proper return packaging and postage. To determine the amount of postage, please contact the carrier of which you will be using. Sender is responsible for including proper packaging for any personal items sent as well as any shipping insurance desired. Any damage done to said items must be referred to carrier that sender chose. 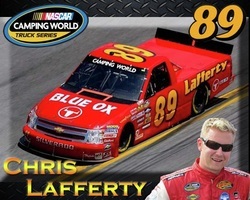 Lafferty Motorsports is not responsible for damage due to negligence of the carrier.